Before you complain to the bus company that your bus is late/cancelled/crowded, you might want to check that they still run the service. In August, a whole bunch of routes (including most Smartbus routes) formerly run by Ventura and Melbourne Bus Link were taken over by Transdev. Other recent changes include Ventura taking over Grenda (which includes Moorabbin Transit), and Easttrans (CDC) taking over Driver. Seems it’s all go in the bus industry these days. Transdev, in a reply to a query on Twitter, have noted that the stickers (as seen above) are a temporary measure. Eventually they’ll get the PTV livery. While I quite like unified designs for the bus fleet, there is a down side: some passengers tell approaching buses apart by not just the numbers, but their operator colours. It’ll be interesting to see how people handle that. Daniel, your post is very timely. I saw a Transdev bus at a bus stop near my place and thought it might be a tourist coach since it didn’t have PTV logo. Now I know that Melbourne Bus company is no more. I heard a rumor the other day that Ventura is looking at selling the Grenda’s routes. I would think it would be unlikely but will wait and see. Ah yes, standing at the Queensbridge bus stop, I want the white bus, not the red and cream one. I think that may have changed in recent years. You’ve motivated me to check who owned MBL and it was Dysons, previously with Reservoir Bus Company which was taken over by Dysons. Wow Chris, that is a good rumor. I shall go straight over to Bus Australia with that one. I like the idea of a uniform livery on all PTV routes. While I admit there is the issue for some people by having all of the buses being the same color, modern destination signs are normally good to read at some distance too. Just not when the bus is turning and you only get to see the side of the bus. It’s worth noting that Transdev is a modern incarnation of that company we all knew so well in Melbourne: Connex. 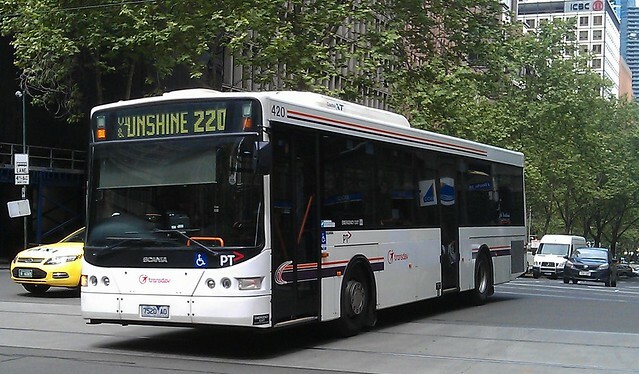 Hi there, any news on when Dyson buses will be repainted with the PTV livery?